This is a great opportunity to go on a shopping spree at the Peet’s Coffee website. They are celebrating their 51st year anniversary with a free shipping promotion (no minimum amount needed). On top of that, you get 15% off automatically, no coupon code needed! 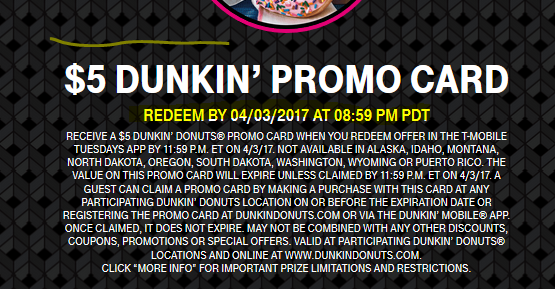 The promotion runs starts March 30 and ends Monday night (April 3) in 2017. Peets is no longer the little engine that could. Now they are owned by billionaires who keep buying coffee companies all around the world. In addition to Peets, they scooped up Keurig / Green Mountain, Paribou, Mighty Leaf, and many more. T-Mobile typically waits for a couple days after Tuesday to reveal next week’s freebies, but April 4 is special, because that’s when they will offer a 1-YEAR MLB.TV subscription for FREE to all T-Mobile customers eligible for the Tuesdays freebies. They already did it last year, it’s true as it says, you get a free full subscription for the baseball season. So today they spilled the beans via press release, the Tuesday April 4 (2017) will have a baseball theme. In addition to the MLB.tv biggie, we’ll get a VUDU baseball movie rental (I don’t know if that’s a store credit or actually restricted to select movies), along with the $2 Dunkin’ Donuts promo returning. Starbucks really really really wants us to visit their stores after 2pm local time, because the “after 2pm Dash” is back again! As usual, check your emails/apps to make sure you are eligible for the offer AND to manually activate it, because if you don’t, you won’t get the bonus. 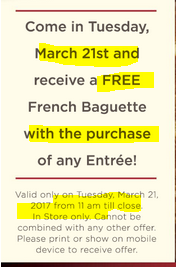 The offer is similar to past promotions, it runs for a week, March 28 to April 3 close of business in 2017. 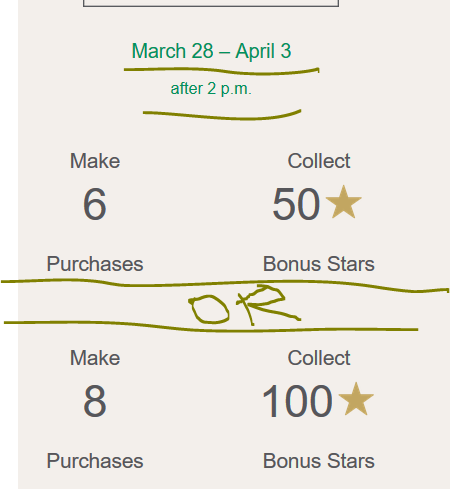 You get 50 bonus stars if you make six purchases after 2pm local time, or 100 bonus stars if you make eight. The way it is structured, basically, if you make six purchases, you have to get to eight for a profit. Simply buy $1 items (string cheese, avocado, or $1.25 tangerines [yes they have these too now! ]), and you come ahead in terms of stars! 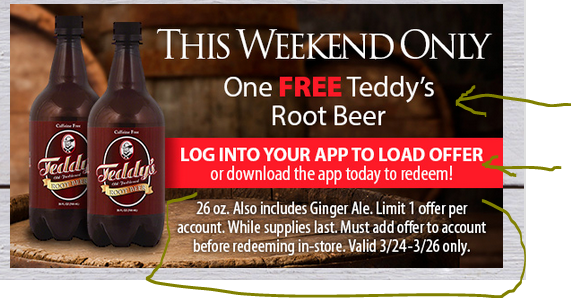 UPDATE: so all you need the app for is to load the offer into your Lucky’s rewards account. You don’t need to use the app in-store. So you can install the app, add the freebie to your card, and uninstall the app. It is horrid permissions-wise (Google Play), and it keeps pestering you to turn on Bluetooth. Why the f*ck does a grocery store app need Bluetooth? Which is why it is a good idea to have a phone running Android 6.0 or later, so you can tame some of the out of control permission grabs! PS: their app is free, you just have to login with your account. If you are worried about permission over-reach, if you are using Android 6.0 or later, you can reign in any permissions you may find objectionable. This is a huge bang for the buck! A 600-page e-book is given away for FREE (and DRM-free) by Tor publishing. It is book #1 of a planned 10-part “Stormlight Archive” book series by Brandon Sanderson. Book #3 is coming out later in 2017, so the giveaway is go generate more interest in the book series and convert freebie-readers into life-long fans (Sanderson writes A LOT and he writes FAST). The book title is “The Way of Kings” – nearly 5000 reviews at amazon.com with a 4.7 out of 5. The giveaway ends Wednesday 3/24/17 night. It is open to US and Canada only due to publishing contracts and such. It is available without DRM in two formats, Mobi and ePUB. You can download both if you like. You have to enter your email address to get the giveaway. Tor is a very respectable entity, you don’t have to worry about abuse of your email. 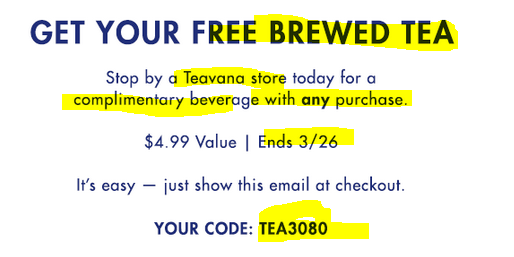 If you live near a Teavana store, and can handle the mall traffic, AND more importantly, you can resist and not succumb to above-average sales pressure, then you can get a free brewed tea (16oz hot or 22oz iced) at a Teavana store using coupon code TEA3080 at their cash register WITH any purchase. This is a good opportunity to try an expensive tea for FREE while making a low cost purchase (or buying one of your favorite teas or accessories). Offer ends 3/26/17. NOTE: if you are a Starbucks Rewards member, you can redeem a Starbucks Reward for 1 ounce of any tea they have. Another way to try expensive teas without paying crazy bucks. You can also pay at Teavana with the Starbucks app and get Stars. If you are participating in the Starbucks Rewards program, check your email or the app. A new promotion just got sent out that announces a second “Double Stars” day for March, Wednesday the 22nd in 2017! This covers almost everything in the store (gift card reloads are NOT eligible for example). This is great timing, because running until March 27, they have promotion that gets you 25% off take-home on coffee and tea purchases (coffee beans, tea bags, K-cups, etc). They also have a 25% off sale on some of the coffee cups, including a lovely new 16oz at-home hot cup that’s $9 after the discount. Starbucks has another YMMV opt-in “Dash” promotion. Check your email or app to make sure you are eligible before jumping in. You have to manually activate it by clicking on the “Join Dash” at the appropriate place in the email or app. 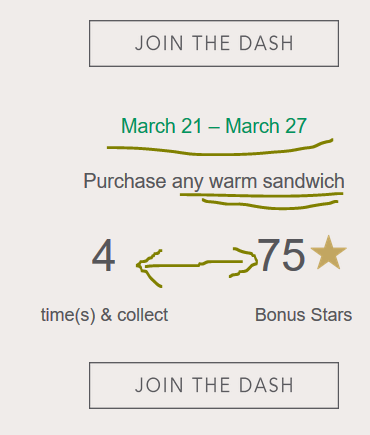 This offer gets you 75 Bonus stars, which are 60% of a full reward, when you purchase four “Warm Sandwiches” between March 21-27 in 2017. Breakfast sandwiches are EXCLUDED from this promotion per the fineprint in their email, so you have to do this with the more expensive paninis. In other words, this offer is best suited for people who already buy these. If you are a fan of card games or if you want to stock up on stocking stuffers or toy donations, run to Amazon! The new condition Uno Card Game is on sale for $2.86 at Amazon by Amazon proper. You can get up to five at this price! There’s only one catch to this, they are currently marked as an ADD-ON product, so the only way the shopping cart will allow you to buy it is if your order total is $25+. Okay of the more affordable name-brand gaming mice is currently the Logitech G300s optical gaming mouse with a total of nine programmable controls. And it is currently on sale with two options, you can get it in new condition for $24. This sold out: or if you want to save even more, you can get it certified refurbished for $16. The new condition averages 4.3 out of 5 based on over 410 customer reviews and has 59 questions answered, while the refurbished averages 4.1 based on 12 customer reviews. They are posted on separate listings, that’s why they have separate review pools. Both options are Prime eligible. If not a Prime member, you get free shipping with a $35+ order.